KANSAS CITY, Mo. — After a few days of crisscrossing this quintessential Midwestern city, you get a good sense of what the current U.S. economic boom feels like. The region that straddles the line between Kansas and Missouri features a nice balance of manufacturing and agricultural industries, a budding tech sector supported by the installation of a public high-speed internet network, an urban center that is seeing a surge in public and private investment and a growing market for sports and recreational activities. The most important factor in boosting business in Kansas City, however, is a solid network of highways and rail lines that connect the community to domestic and foreign markets. Nowhere is this more plain to see than at Logistics Park Kansas City, a 1,700-acre inland distribution hub located along Interstate 35 in Edgerton, Kan. At the center of the park is a state-of-the-art intermodal freight terminal operated by BNSF Railway. While federal tax cuts and the promise of less regulation have invigorated businesses nationwide, it’s places like this that are providing the real impetus for growth here, and elsewhere in America. Since opening in 2013, Logistics Park Kansas City has attracted businesses such as Kubota Tractor Corp., Flexsteel Industries and Jet.com, the e-commerce retailer owned by Walmart Inc.
Kubota, a Japanese company with its U.S. headquarters in Grapevine, Texas, has begun construction of two, 1 million-square-foot logistics facilities on land adjacent to its current leased facility in the park. This new North American distribution center will receive and process shipments from suppliers in Asia, Europe and North America, while continuing to be the primary source for exports of parts for Kubota’s products worldwide. Kubota manufactures garden tractors, construction equipment, lawn mowers and utility vehicles at plants in Gainesville, Ga., and Lincolnshire, Ill. The company also owns Great Plains Manufacturing, a company based in Salina, Kan., that makes farm implements at multiple production sites in Kansas and in Sleaford, England. In announcing Kubota’s latest expansion at Logistics Park Kansas City in July, Edgerton ­Mayor Donald Roberts commented on the importance of companies having access to intermodal transportation services. “The central proximity of Edgerton within the U.S., and its world-class inland port and intermodal facility, give companies like Kubota direct connections to the global supply chain and the ability to quickly and efficiently ship goods by rail and truck to their final destination,” he said. Other companies that have located in the area and are major users of BNSF’s intermodal terminal services include: ColdPoint Logistics, a specialized warehouse that provides global distribution of meat products; Horizon Global Corp., a Troy, Mich.-based manufacturer of towing and trailer equipment; and UPS Inc., the Atlanta-based parcel carrier that is also the nation’s single largest intermodal shipper. 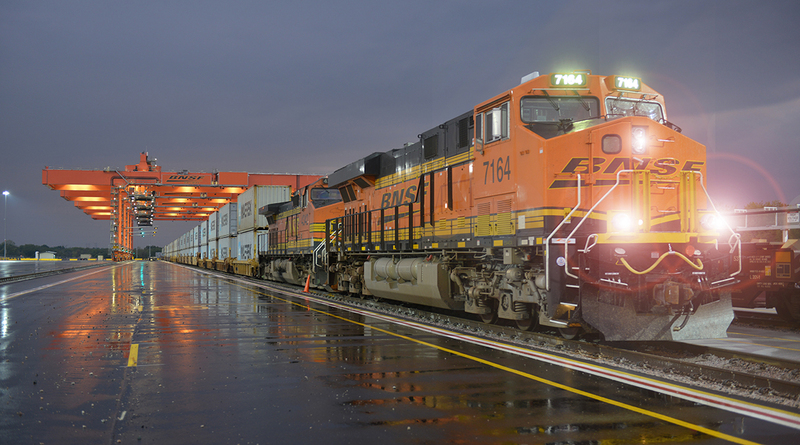 For BNSF Railway, Kansas City is now one of the fastest growing intermodal hubs in the company’s network. The terminal itself is the third-largest (after Chicago and Dallas) in terms of size (443 acres) and is designed to handle more than 750,000 container lifts annually. It’s also one of the more advanced in terms of using automation to make it faster and easier for truck drivers to pick up or drop off containers at the facility. Joseph Lumbert, senior man­ager for hub and auto operations at BNSF Railway, said the goal is to get trucks in and out in less than 30 minutes. To achieve that, trucks enter the intermodal terminal through a gate outfitted with scanners and video cameras to capture all of the relevant information about the driver and the vehicle. That information is matched with data on shipments to provide a precise time and location for moving containers and trailers from rail cars to trucks. “We’re working on the next-­generation smart work order,” Lumbert said, adding that there are limits to how much automation can be used at rail terminals compared with seaports. “It’s more difficult here because we’re handling expedited shipments and there’s more customer service you have to provide,” he noted. Another place where rail intermodal service is spurring economic development is 40 miles southwest of Chicago in Wilmington, Ill., where BNSF and Union Pacific have terminals for handling containers coming from ports on the West Coast of the United States. RidgePort Logistics Center is one of two massive industrial parks in the area that has become a magnet for manufacturing and distribution activities. The other is CenterPoint Intermodal Center in nearby Joliet and Elwood, Ill. Since opening in 2015, more than 6.3 million square feet of space has been developed at RidgePort, including 2 million square feet of space for Michelin USA and a just completed 1.5 million-square-foot distribution center for General Mills. An additional 800,000 square feet of speculative development is planned in the next year and, when fully developed, RidgePort will be the largest distribution center in the Midwest, according to officials at Elion Partners, a real estate investment firm that owns the property. Rep. Adam Kinzinger (R-Ill.) recently toured the site and said he was very impressed by recent developments in the area and the long-term impact that the RidgePort facility will have on the local economy. “I can already see the value it has and will continue to bring to our community,” he said. In Maryland, an abandoned steel mill near the Port of Baltimore is being redeveloped into a 3,100-acre multimodal logistics center called Tradepoint Atlantic with access to ports, railroads and highways in the Mid-Atlantic region. FedEx Ground became the first tenant with the opening of a package distribution hub in 2017. That was followed by construction of a 1.3 million-square-foot warehouse by Baltimore-based apparel maker Under Armour that is due to open in 2019. Online retailer Amazon.com has also committed to building an 855,000-square-foot fulfillment center on the site. Across the country in Great Falls, Mont., a group of private business leaders pooled their resources to pay for an extension of rail services from a BNSF Railway main line into a 197-acre agri-tech park that now includes an oilseed processing plant, a FedEx Ground package distribution hub and a fertilizer warehouse operated by Helena Chemical. Pacific Steel & Recycling is moving from another location in Great Falls into a new facility in the park later this year. Brett Doney, CEO of the Great Falls Montana Development Author­ity, said the group is working to attract new projects, including an ethanol production plant, to take advantage of the region’s agricultural output and to ­strengthen ties with trading partners in Japan and Canada. While trade sanctions imposed by the Trump administration have hurt farmers by raising costs and curtailing demand from buyers overseas, Jolene Schalper, vice president of the development authority, said it has also increased interest in foreign direct investment in building processing plants for crops grown in the area, including chickpeas, lentils and other legumes that are becoming popular sources of protein in food. Virtually all of those prospects, Schalper noted, say having rail service is a pivotal factor when deciding where to locate. “We also see more demand from existing companies for transloading,” she said. Kansas City’s emergence as a shipping hub is seen by many as an important factor in not only attracting new business, but helping existing companies thrive. Garmin International Inc., for example, is in the midst of a $200 million expansion of its corporate ­offices in Olathe, Kan., adding 720,000 square feet of manufacturing and distribution space to support the company’s aviation business and converting existing warehouse and production space into research and development offices. Some of the new distribution space will be devoted to handling global returns and replenishment of Garmin products, including GPS navigation devices and fitness trackers produced in Asia and Europe and sold throughout the world, as well as avionics for aircraft and other mobile electronic devices for automotive, marine and outdoor applications. Kansas City is home to assembly plants for both General Motors and Ford Motor Co., and the Brookings Institution recently listed the region as the second most important automotive center in the United States. Magna International operates a seating plant in Excelsior Springs, Mo., and a body and chassis plant in Liberty, Mo., and is one of the largest suppliers of components to automotive manufacturers globally with 335 plants and 96 product development, engineering and sales centers in 28 countries. In February, Faurecia, a ­global supplier of automotive seating and interior systems based in France, announced plans to build a $60 million production facility in Blue Springs, Mo., to make door and instrument panels.